Revengeofthe5th.net: Amazon has 6" Star Wars Black Series figures as low as $8.99! Amazon has 6" Star Wars Black Series figures as low as $8.99! We couldn't resist posting this, since we know many of you love this new series of figures. Amazon is running a HUGE special on Star Wars Black Series figures and other exclusive items, including the 6" Luke X-Wing for $8.99! The Amazon Exclusive Legacy Collection 6-pack "Droid Factory" figures are $23.99 for the set! Click the links below, because these will sell out fast! Star Wars The Black Series Luke Skywalker Figure 6 Inches $8.99! 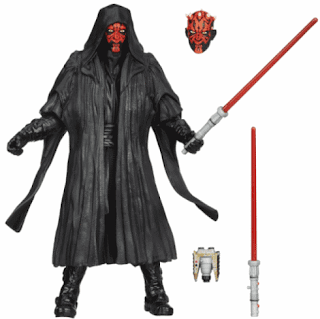 Star Wars The Black Series Darth Maul Figure 6 Inches $10.12! Star Wars The Black Series R2-D2 Figure 6 Inches $10.12! Star Wars The Black Series Sandtrooper Figure 6 Inches $10.12! Star Wars The Black Series Greedo Figure 6 Inches $11.99! Star Wars The Black Series Darth Vader Figure 3.75 Inches $4.99! Star Wars The Black Series Biker Scout Figure 3.75 Inches $4.99! Star Wars The Black Series Luke Skywalker Yavin Ceremony Figure 3.75 Inches $6.59! Star Wars The Black Series Clone Trooper Sergeant Figure 3.75 Inches $4.99! Star Wars The Black Series Clone Pilot Figure 3.75 Inches $4.99! Star Wars The Black Series 41st Elite Corps Clone Trooper Figure 3.75 Inches $5.89 !